TL;DR: In this article you will learn to validate and sanitize data in your Express.js applications using a set of middleware called express-validator. You will do so by completing a demo application that takes in user input and validates/sanitizes it using this library. If you want to see the complete application developed throughout this article, take a look at this GitHub repository. Node.js and NPM (Node Package Manager). While writing this article, the author used Node.js v8.13.0. Any text editor or IDE of your choice (VS Code, WebStorm, Atom, Sublime, etc.). 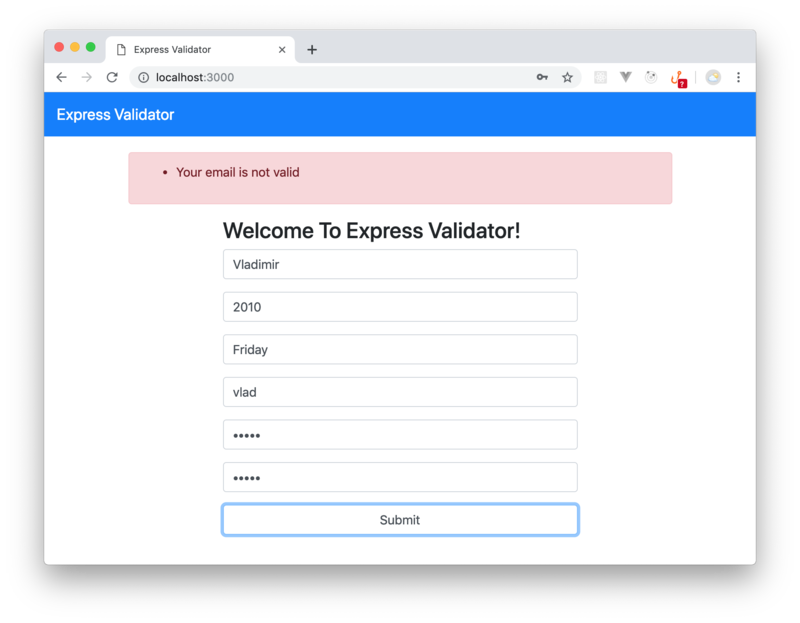 According to the official website, Express Validator is a set of Express.js middleware that wraps validator.js, a library that provides validator and sanitizer functions. 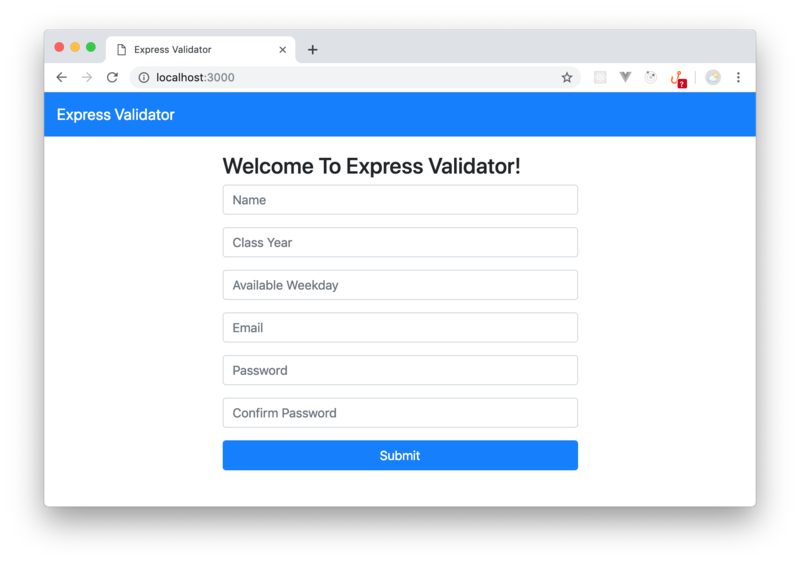 Simply said, Express Validator is an Express middleware library that you can incorporate in your apps for server-side data validation. This simple Express application contains just enough for you to get started and focus on learning about the express-validator library. For example, if you check the views/layout.pug file, you will see that it contains some basic HTML elements to define how the app should look like. Note: If you are not familiar with Pug, the template engine, you might find the syntax of this file a bit different. Don't worry, you don't need to be acquainted with Pug to follow this article along. Also, if you take a close look to the source code, you will probably understand what is going on. For example, you will see a line starting with link that contains the href keyword pointing to a BootStrap file. This is just the code telling the browser to import an external CSS file, quite similar to what you would do in HTML. ./routes/index.js: This file is responsible for rendering the homepage of your app. The res.render('index') line will make Express and Pug work together to render the views/index.pug file. ./routes/users.js: For now, this file adds an endpoint to your app that doesn't do anything. Soon, you will start using this file to learn about the express-validator library. With that, you now know how the app is structured, but don't run the project yet! You still need to define the home page of your app. h3 Welcome To Express Validator! What you are doing here is to add a bunch of input elements to the homepage that will receive user input to be sent to the backend. With that covered, you have everything in place to have a sneak peek at the app. Go to the project root directory and run the following command to get the app started. Note: You can stop the server now, but whenever you add a new feature/functionality, you will need to restart the server if it is already running or just start it. From the code above, on form submission, a POST request is made to the http://localhost:3000/users endpoint with the data entered by users on the HTML fields defined before. If there is an error during validation, this code will make sure to display the error messages inside a div marked with the alert class. If no errors are found, a successful validation will trigger an alert with this message: "Your submission was successful". The string passed as an argument to the check function specifies which data field you want to validate (e.g., classYear). The not().isEmpty() function chain makes the library validate that this field is not empty. The string argument added to withMessage() specifies a custom error message which will be send back to your users if this particular field violates a validation requirement. Note: You can also provide a custom error message by passing it as a second argument to the check() function. By calling the optional() function on it, you have made the weekday field optional. So far, you have only specified how you want your fields to be validated. You might be wondering where Express.js actually does the validation. Validation happens in the request handler when it calls the validationResult() function. To test this, run your application and submit an empty form to the server and you should see the following error displayed in red. Remark how there is no error for the weekday field, this is because you made the field optional during validation. Pretty cool, huh? Now, restart the app and try to enter a name and password less than five characters long. You should see the app complaining about the field length. Now, after restarting the app, if you try to enter a value which is not an integer in the class year field, you will see an error message. Also, if you enter "Saturday" or "Sunday" in the weekday field, you will see the backend complaining. Express Validator also validates emails with the isEmail() function. Besides that, you can also make this library normalize emails with the normalizeEmail() function. In case you are wondering what it means to normalize an email, you can read about it in this Stack Overflow post. That is, Express Validator transformed the malicious code into special HTML characters. Amazing, right? The custom function takes in a function (an arrow function in this case) as an argument and checks if the value of the confirmPassword is the same as the value of the req.body.password field. To see this in action, restart your app, then enter a different password and you should get the message saying that "passwords do not match". 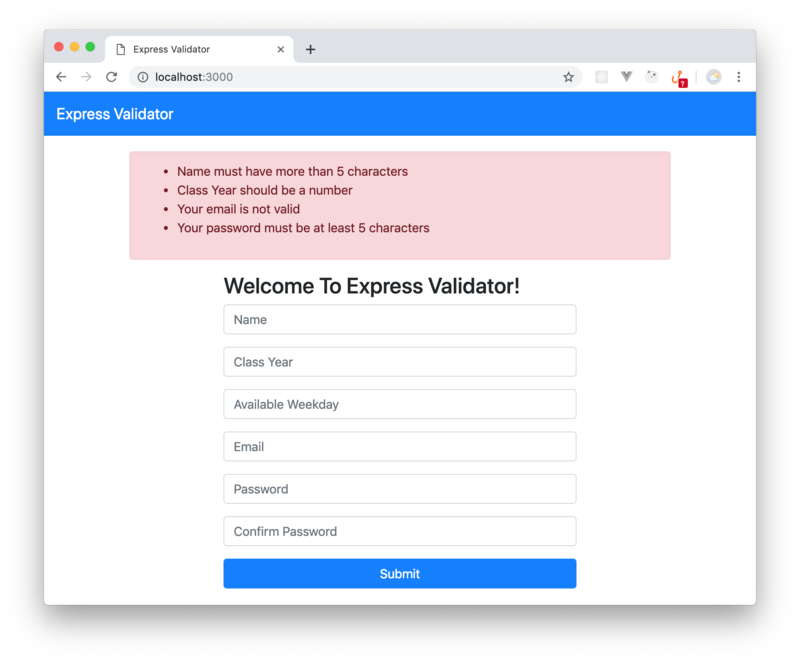 In this article, you learned how to use the Express Validator middleware to validate and sanitize user data in an Express application. Guess what? You only scratched the surface of what is possible with Express Validator. Aside from learning more validation and sanitization functions, you can learn how to add wildcards to your validations, do schema validation and whole body validation from Express Validator's documentation. I will love to see what you build with Express Validator.